The cash conversion cycle (CCC) is a critical metric that shows how long it takes for an organization to convert its resources into cash. In short, this metric shows how many days it takes to sell an item, get paid and pay back suppliers. When the CCC is negative, it means a company is getting financed by its suppliers to run the operations. In other words, how long it takes for an item from when it sits in your inventory to when it is sold. How long it takes for you to cash the sale. And how much time you have to pay back suppliers. Quick example: Imagine you buy from an online store (just like Amazon). You ordered an item and spent $50. You’ll get the item in 7 days. The online store has already collected the $50 and will ask the supplier to send it over to you within a week. But the store will pay the supplier only after 30 days. This means that now the store has $50 that can spend the next three weeks before the amount is due to the supplier. Those three extra weeks are crucial as the money could be spent to order other items and sell them with the same cash conversion cycle. Therefore when an organization learns how to use its cash conversion cycle appropriately, it can become a sort of cash machine business strategy to fuel the growth of the business. I want to show you how Amazon uses a negative cash conversion cycle to generate extra liquidity to power up its business growth. If you look at Amazon income statement, you’ll see that its net income is meager. In fact, as of 2016, it was almost 2.3 billion dollars compared to its total revenues of nearly $136 billion. True, Amazon is a store, and as such it will have lower margins compared to other tech giants that operate in the advertising space (like Google or Facebook). As you can see Amazon net income in comparison to its revenues is 1.7%. It seems that Amazon primary business strategy is to be entirely aggressive in both pricing and service offering. That is how it managed to disrupt a few industries along the way. But if its net income is so meager how’s the company generating cash to sustain the business? Amazon is quite successful in managing its cash conversion cycle. In fact, as of 2017, gurufocus.com reports that Amazon has a cash conversion cycle of -26.92! Amazon.com Inc’s Days Sales Outstanding for the three months ended in Dec. 2017 was 19.87. Amazon.com Inc’s Days Inventory for the three months ended in Dec. 2017 was 35.27. Amazon.com Inc’s Days Payable for the three months ended in Dec. 2017 was 82.06. 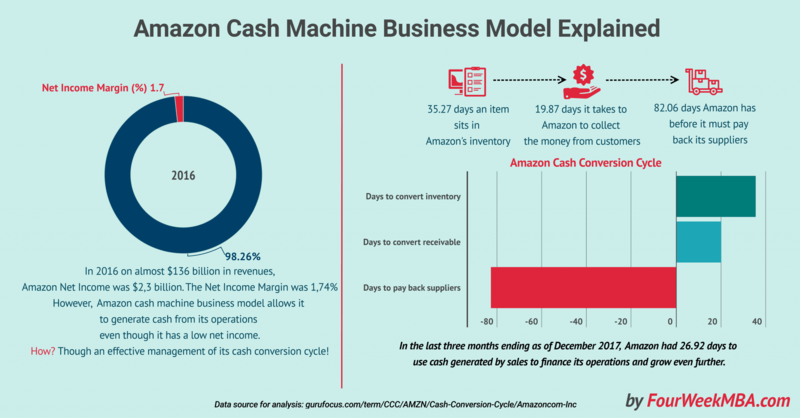 Therefore, Amazon.com Inc’s Cash Conversion Cycle (CCC) for the three months ended in Dec. 2017 was -26.92. It practically means that Amazon has almost thirty days before payments are due to its suppliers, while it has already generated available cash for the business by selling items in its online store! With digitalization, it has become easier for online stores to manage their cash conversion cycle. For instance, think of the case in which you open up a store with a simple landing page. You don’t have anything down yet, but you start getting sales in. Once an item gets pre-ordered, you can get it from a supplier and send it over to a final customer. In short, digitalization helps companies keep a more efficient inventory based on what customers order online even before they have it sitting in the inventories. That is not an Amazon case. Amazon played the opposite business strategy: build giants super-organized inventories called Fulfillment Centers. Another aspect is the company’s ability to negotiate convenient payment terms with its suppliers. If you’re able to stretch the payments agreement terms in a way that allows you to run your business on credit, it becomes easier to have excess cash to invest in the business operations growth. Just like Amazon has been doing in the last years. Another critical element of Amazon successful cash business strategy was built upon a network of publishers around the web, that in exchange for a referral to Amazon products could get a fee. This is the premise of affiliate marketing, on which Amazon has also built its fortune. The cash conversion cycle is a crucial aspect of any business which success is based on short-term liquidity. When current assets minus current liabilities is positive, it means the company can generate extra cash from its operations. If well managed the cash conversion cycle can become a sort of cash-making machine that generates additional liquidity for an organization. Amazon can teach you just that. It doesn’t matter how meager your net income is. If you have the cash to run the operations, you can grow wildly!